Announced in May 1992, the Quadra 950 was a "speed bump" of the Quadra 900. The processor was upgraded from a 25 MHz 68040 to a 33 MHz. The Quadra 950 sold for $7,200. That's not quite right. The CPU uses a frequency speed of 33 MHz for all calculations. There is a 66 MHz frequency input port on the chip but this frequency is not used for code executing parts of the CPU. The 68040 is *not* capable of frequency-doubling like the Intel 80486DX-2 or later CPUs. You may have a look at the M68k-FAQ of news://comp.sys.m68k or at the Motorola specifications. 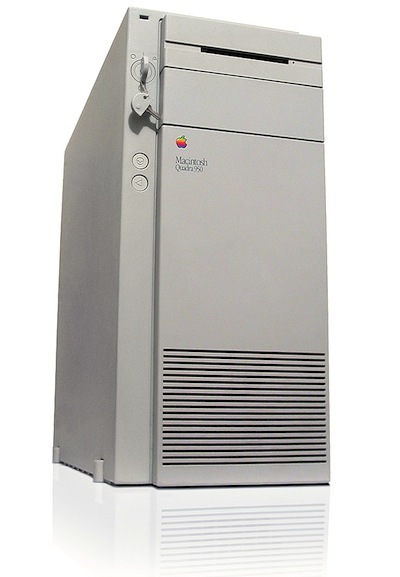 Apple published ads for a long time praising "50 MHz" Performa 475s but after a law suit against them they had to pay 140 DEM (in Germany) to each who bought such a machine due to incorrect/false information about the machine which runs only at 25 MHz. No, it was "optional". There was the WGS95 PDS update card bringing 128-512 kB L2 cache to the WGS95, in addition to two extra SCSI DMA ports. I can send you a photo of this device if you're interested. The Q950 has two SCSI chains - one "fast SCSI" (up to 10 MB/s) and one "narrow/slow SCSI" (up to 5 MB/s). It was optional as the DDS streamer drive was. In addition the video was accelerated.